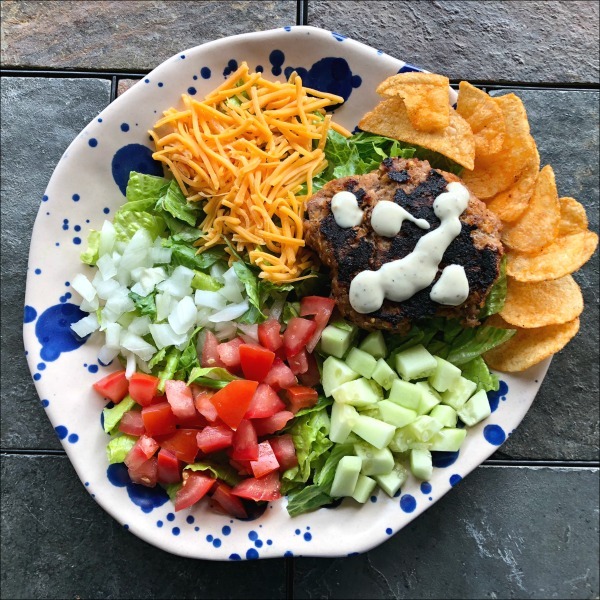 It’s a healthy ground turkey recipe today! 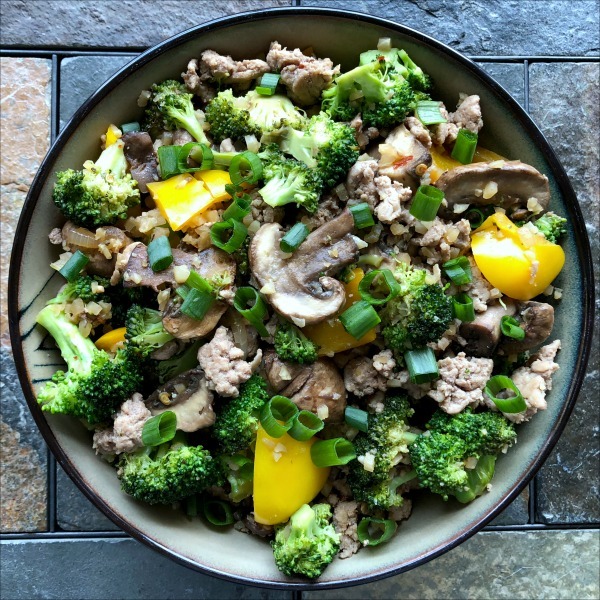 Ground turkey stir fry with cauliflower rice is an easy 30 minute weeknight dinner in a bowl — Enjoy all of your meat and veggies, together in one handy low carb dish. I know that a ground turkey stir fry isn’t necessarily traditional, but figured: If you can use ground pork in a stir fry, why not? This Ground Turkey Stir Fry with Cauliflower Rice is a filling twist on your more usual stir fry dinners, and makes for a great all-in-one 30 minute weeknight meal. Here I also threw in a bag of riced cauliflower that has been languishing in my freezer for a while. 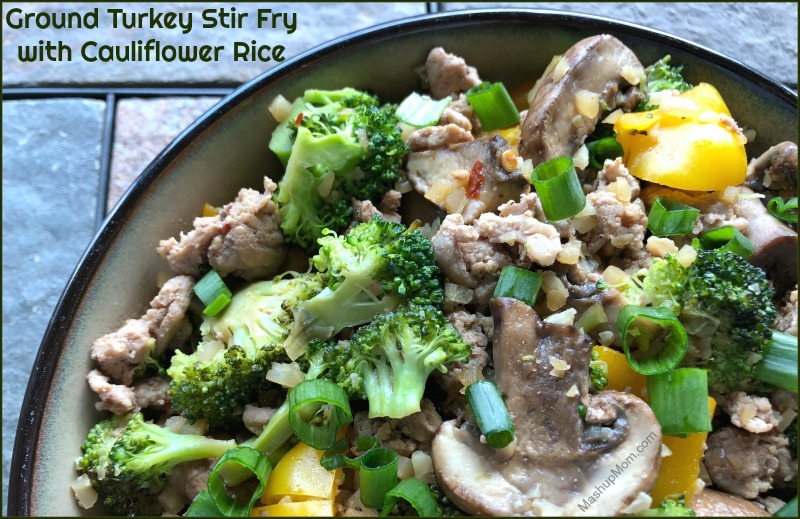 This helped add a little more texture and break up the meaty turkey in this hearty stir fry recipe. 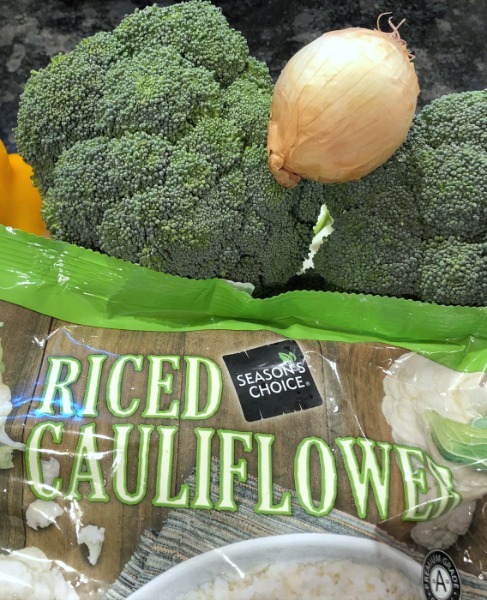 Using riced cauliflower rather than rice keeps the recipe pretty low carb, too — although the sauce does contain a little brown sugar, it’s not much when divided among four servings and helps keep this a healthy weeknight ground turkey recipe. 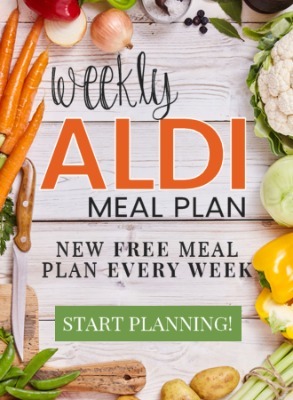 Note also that ALDI carries frozen riced cauliflower as a regular buy now! If you prefer, though, you can simply make your own by pulsing fresh cauliflower florets in your food processor until they are at the right riced consistency. How’s that for a pretty all-in-one dinner bowl? Brown the ground turkey in a large skillet over medium-high heat, breaking up as you go, until cooked through. Remove to a separate bowl. Add 1 Tbsp canola oil and 1 tsp sesame oil to the same skillet and heat briefly over medium-high heat. Add onion and broccoli and stir fry over medium-high heat for two minutes. Stir in the 2nd Tbsp of canola oil along with the bell pepper, garlic and mushrooms, then continue to stir fry for another three minutes, stirring occasionally. Gently stir in the frozen riced cauliflower and continue to stir fry over medium-high heat until cauliflower is heated through and beginning to brown, stirring occasionally. Return the cooked ground turkey to the pan. 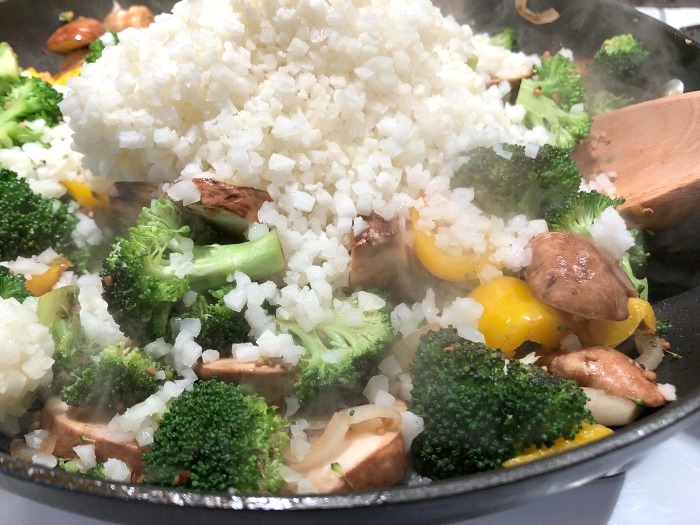 Stir the sauce to recombine the ingredients, then add the sauce to your skillet and continue to stir fry, stirring occasionally, until everything is nicely combined and heated through. Top your ground turkey stir fry with optional chopped green onions, and serve. Add additional soy and/or chili garlic sauce to taste, if desired. Note: You can change up the veggies as desired — green beans would be great in this recipe, or you could wilt in some chopped spinach or kale near the end. Dinner in a bowl, done! Get all of your meat and veggies together in one dish when you stir fry up this easy 30 minute weeknight dinner recipe for four. 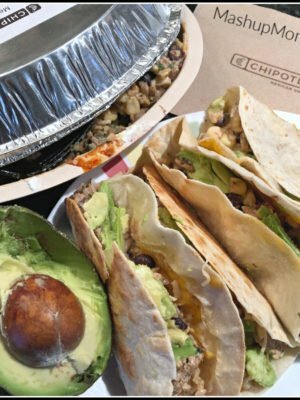 This recipe contains just enough sauce to impart flavor, but don’t expect it to be overly “saucy” — since you’re not serving it over rice or another grain to soak that up. 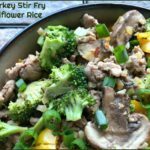 This recipe for ground turkey stir fry with cauliflower rice is low carb, and can also easily be gluten free if you choose to use a GF soy sauce or tamari. 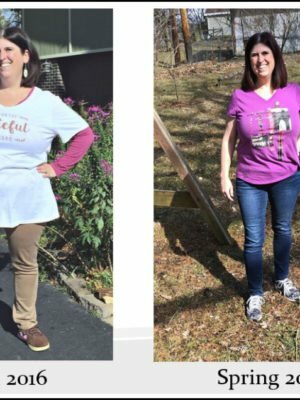 … Or, simply substitute ground turkey in just about any recipe where you would normally use ground beef. Dinner in a bowl, done! Get all of your meat and veggies together in one dish when you stir fry up this easy 30 minute weeknight dinner recipe for four. You can change up the veggies as desired -- green beans would be great in this recipe, or you could wilt in some chopped spinach or kale near the end. I used celery instead of broccoli. It was a little salty for us, so, I would cut back on the soy sauce next time. It was a really easy recipe and very tasty. Yum. My Alsi didn’t have the frozen Rice Cauliflower, I have a head of Fresh Cauliflower. Can I just cook that and mash it? Don’t cook it — just cut into florets and pulse in your food processor until they are a rice like consistency. (Watch it — use pulse and don’t leave it on because they will quickly turn into puree.) The small pieces will cook up in the pan with the stir fry. 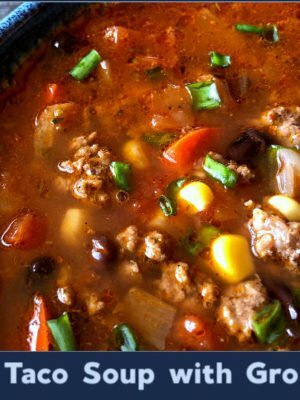 Would I need to adjust the recipe terribly if I substituted small shrimp for the ground turkey? I have a thing of salad shrimp in my freezer that I thought I could use instead of buying the ground turkey. I added zucchini instead of broccoli, I used too much broccoli earlier in the week. It turned out really nice. 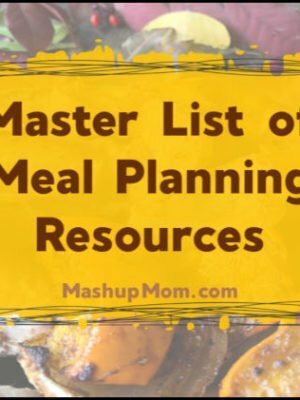 You are a life saver for these Aldi Meal plan!! I had to sub rice because we are rice lovers. This is amazing. I had 3 helpings, I don’t think I have had 3 helpings in years. Siracha on top made it.